Police investigate a shooting at North and Pennsylvania avenues on May 18, 2015, in Baltimore. Baltimore saw 43 homicides in May — the city’s deadliest month in 40 years. Some commentators have attributed this rise to protests and increased scrutiny of law enforcement after the funeral for Freddie Gray, who died in police custody in April. This “Ferguson Effect” has supposedly spurred a decline in both police presence and action. Writing at the economics blog Marginal Revolution last week, Alex Tabarrok looked at Baltimore arrest and crime numbers over the past four months and found that homicides, shootings, robberies and even auto thefts had indeed risen while arrests had sharply dropped. But it’s necessary to look at these changes in context, and four months of arrest and crime data isn’t enough to determine a true trend. In particular, it’s useful to look back earlier than February, because seasonality has a significant impact on violent crime rates. We pulled arrest data from the Baltimore Police Department since 2013 and crime data since 2011. 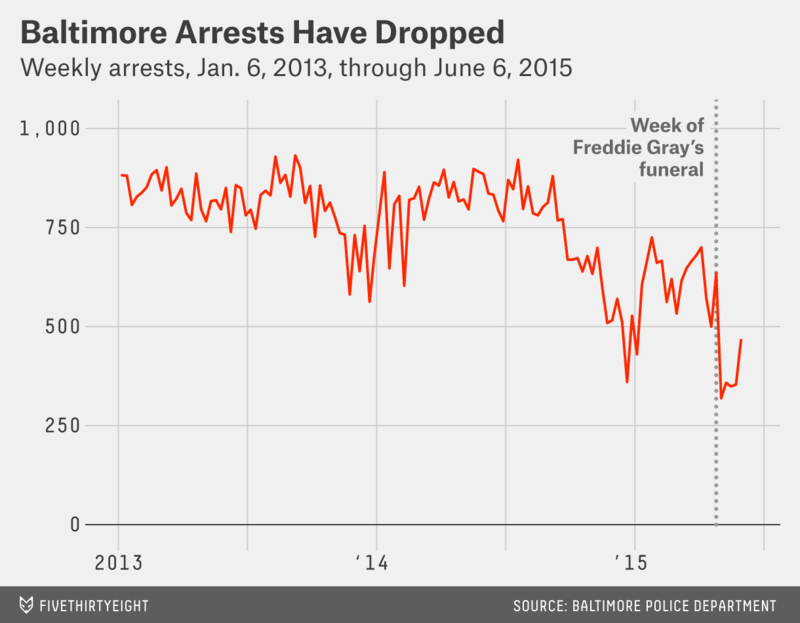 During the week of May 3, the Baltimore police made 319 total arrests. That’s a 61 percent year-over-year decline and 41 fewer arrests than the previous low (since 2013), set last Christmas. 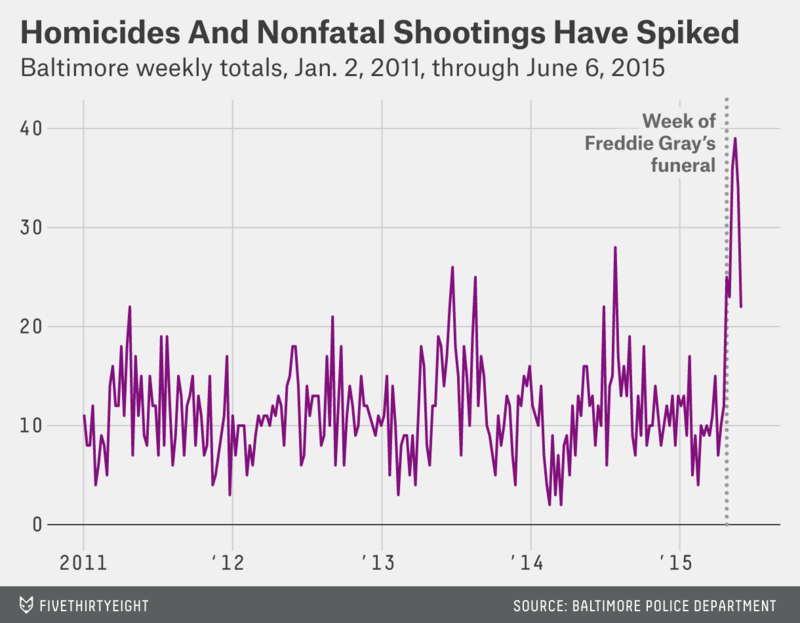 There were 12 homicides and nonfatal shootings in Baltimore the week before the funeral, nearly matching the weekly average from 2011 up to that point (11.3). The next week, that figure doubled to 25. Three weeks later, 39 people were killed or shot in the city, an average of more than five a day. 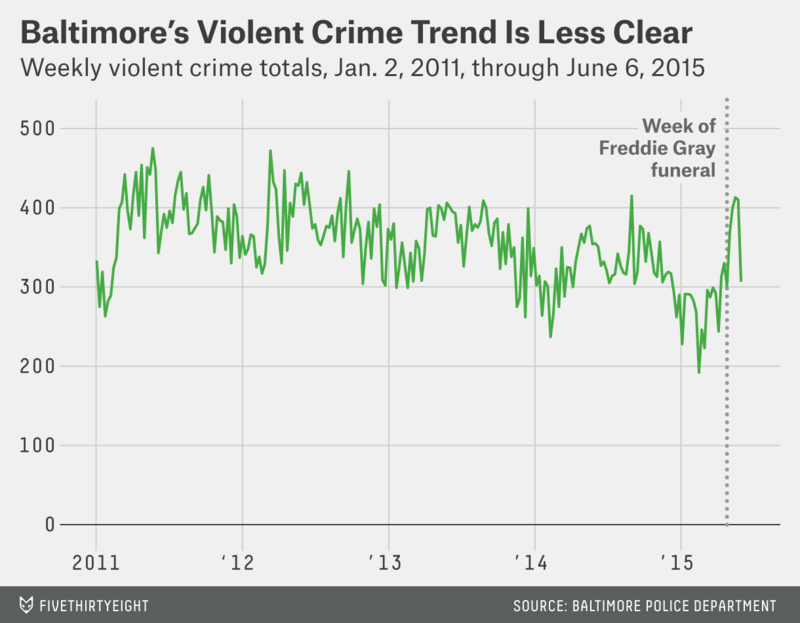 The beginning of 2015, a four-year low in violent crime, looks like the real outlier. This isn’t to say that Baltimore doesn’t have a serious problem. A 9 percent rise in violent crime is a reversal of an encouraging, multiyear trend. And though all violent crimes are destructive, a spike in homicides is a more serious issue than an equivalent spike in robberies. It’s also possible non-homicide violent crimes are going underreported, at least as compared to before the funeral. But the latest week of available data shows some evidence of a reversal: Homicides and shootings dropped 35 percent and violent crime dropped 25 percent from the previous week, while arrests climbed 32 percent. CORRECTION (Feb. 5, 4:55 p.m.): An earlier version of this article provided an incorrect link to the police data set we used to conduct this analysis. The link should have gone to the Baltimore Police Department data, not the Baltimore County website. The data used in the article was correct and the analysis is unaffected. The error was noticed by a reader, who alerted the reporters.